During Virginia’s hot and humid summers, pools can be a lifesaver. Taking a dive in your backyard or neighborhood pool is the best thing for a scorching day where the sun is shining and the temperature is 90 degrees or more. While considering pool construction plans it is also essential to think about a fence to surround the pool and what the guidelines and requirements are for your pool fence. Why do you need a pool fence? The reason for laws mandating pool fences is ultimately for safety. By restricting access to the pool someone who is just walking by can’t just trip into your pool. A pool fence protects against potential or near drowning. It can especially prevent young children who have not yet learned to swim from falling into your pool. A pool fence can also protect your pool from vandalism or unwanted visitors who wanted to take a dip in your pool. 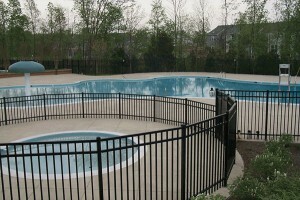 It is required by Virginia law to have a secure fence around your outdoor swimming pool. Any outdoor swimming pool, whether it is in-ground or above-ground needs to have a barrier that is at least 48 inches in height. Around your pool fence make sure there are no permanent structures, like a electric box or a tree trunk that could be used to climb the fence. For every type of fencing material there are different requirements so for your specific needs, talking to your local fence company is the best option. For the most common pool fence options keep reading! Make sure that if you’re using masonry or a stone wall to enclose your pool there are no indentations or holes in the structure, except for any natural construction imperfections. Also check all around your fence to make sure there is no area where someone could easily climb the wall into your pool. There two different categories for wooden pool fences under Virginia law depending on whether the distance between the vertical and horizontal wooden panels is less than 45 inches apart or if they’re 45 inches apartment or more. For wooden pool fences that have less than 45 inches between the horizontal and vertical panels there has to be 1¾ inches or less space between each vertical panel. For fences that have 45 or more inches of space between the vertical and horizontal wooden panels you can have up to 4 inches of space between each vertical panel. For both types of wooden pool fences you can only have a maximum of 2 inches from the bottom of the fence to the ground. There are so many options of pool fences that you can pick the one best suited for you and for ensuring the safety of others. Protect your investment and others with a quality fence from Hercules Fence. Hercules Fence has been providing professional service and quality installation for both commercial and residential fences since 1955. Over the years, we developed a reputation for quality work and fare, competitive prices. As the largest fence company in Virginia, Hercules Fence is able to offer you a premium quality wood fence without the premium price tag. Talk about a win-win! If you have any questions about Virginia law for your pool fence, you can contact Hercules Fence of Newport News, Virginia today by calling (757) 316-3600! We are the largest fence company based in Northern Virginia. You can also follow Hercules Fence on Facebook, Twitter, Google+ and YouTube. This entry was posted on Thursday, February 5th, 2015 at 3:12 pm. Both comments and pings are currently closed.